After one too many pranks, Felix O’Neil is expelled from High School. Obviously, he’s going to be stuffed if his parent’s find out so of course Felix sets out to make sure that doesn’t happen. Transparency disclaimer: I am most obviously not the age range this film was targeted at. Starring Cameron Dallas who has made his name on Vine and Youtube the film is a teen comedy in the vein – loosely – of Ferris Buller’s Day Off. In one of the opening sequences Dallas’ Felix says “Life is a series of missed opportunities.” Not a truer word will be spoken in the rest of the movie. Expelled suffers from under developed plot lines, cardboard cut out characters and needed a stronger hand in the development stage. There are so many missed opportunities in this film. The film tries to be too many things to too many people, and in the end it never rises to its full potential. Another character that really has zero impact on the script is that of Felix’s brother, who has posted himself home from military school to escape. This is another character that is under-developed, under-utilised and could have been so much better. The film lacks a central heart. There’s nothing beyond “Ohh if my parents find out I’ve been expelled they’ll send me to military school,” which isn’t enough to hang a film on, not even one that is aimed at a young teenage audience. 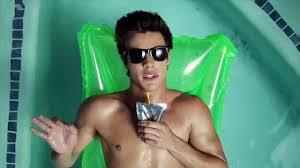 This film is most definitely a vehicle to raise the profile of youtube/vine celebrity Cameron Dallas. He does well in his first acting role. The character of Felix is cheeky, cocky and Dallas definitely has the charisma to hold the viewers attention. I’d like to see him in something that has some bite to it rather than another fluffy teen comedy. He appears to have the talent, but it needs a stronger, and better developed vehicle than Expelled to really shine through. The end of the film was a dud. The resolution – how Felix triumphs over the evil Principal – has nothing to do with Felix or his ingenuity, but rather appears to be a tack on when the films writer realised he needed to end the screenplay. There is no moment of realisation for Felix, no moment where he understands the role he has played in his own demise. Instead, we result to blackmail. Expelled is okay for what it is, a mindless teen comedy about a smart arse kid out to live life on his terms. I’m sure the kids will love it. It’s just disappointing that so many opportunities were missed and so many chances to turn a below average film into a top notch one were ignored. Next PostWhen Hashtags Need A Safety Word….